As soon as the ‘W’ shaped stand is placed out in front of you – you know there is going to be nothing traditional about this experience. Australia’s premiere W Hotel has shaken things up – and I think you’ll be pleasantly surprised. The ‘sandwich’ portion of this high tea is the first hint that things are going to be a little different. You begin the experience with probably my favourite thing on the entire menu – that’s not to say it’s all downhill from here, it was just that good! The charcoal cone filled with Fraser Island crab and topped with Smoked Yarra Valley pearls was divine. There’s just no other way to describe it. It completely coats your mouth with its delicious flavour and leaves you wanting more (more on that later). Next, we devoured the only thing that slightly resembled a sandwich, white bread stuffed with Toowoomba free range egg and native finger limes, in the shape of a samosa and topped with Osciestra caviar. The mini toast topped with Darling Downs grass fed fillet, enoki and horseradish cream melted in your mouth with the most perfect creamy and crunchy texture, followed by bilini topped with Australian Waldorf salad. Have you caught onto the theme yet? 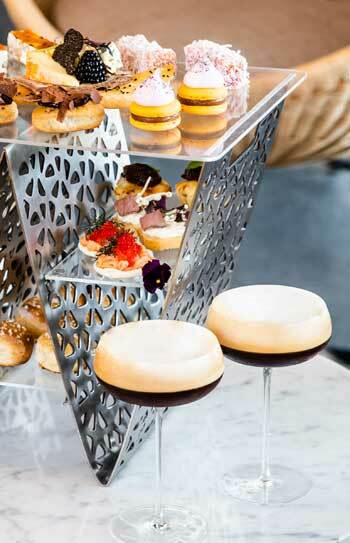 This aptly named High Tea of Aus, takes your palate on quick journey around the great southern land. From Victoria, to Far North Queensland, and the bush. You’re never in the same place for too long. Even the hotel’s décor is a nod to its home in river city. The design theme, ‘A River Dreaming’ is modern and chic, with the curves around the building mimicking that of the Brisbane River. 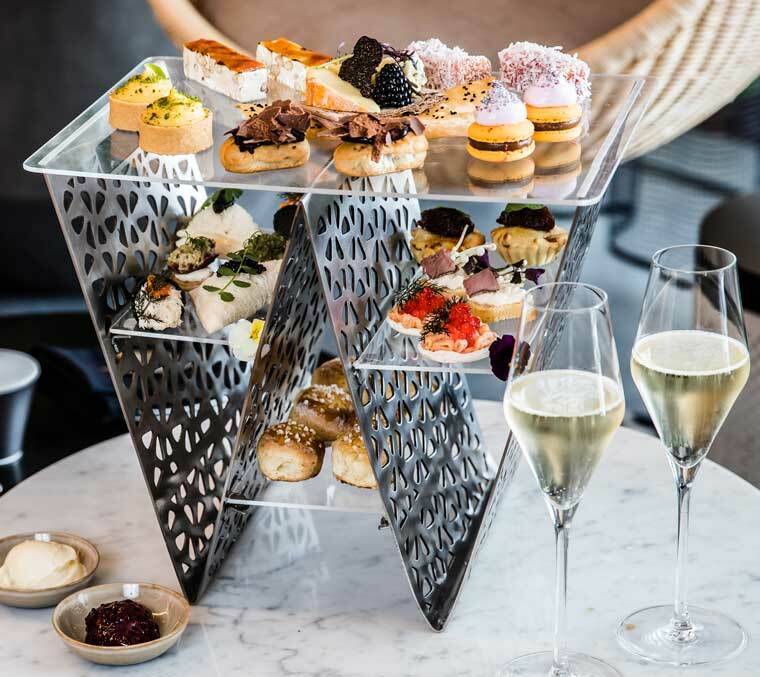 Before I go any further, I want to point out that this high tea will only set you back $55 per person, $69 when paired with a delicious glass or Veuve Clicquot Champagne or a Mezzo Mezzo Martini and $74 with a glass of Veuve Clicquot Rose Champagne. And I’ll advise you this now reader, treat yourself to the that glass of champagne or drink of your choice. This is one high tea that deserves that delicious pairing. Once you’re finished your sandwich tier – but before you can work your way up to the delicate desserts the friendly staff at the W will bring out the next portion, which is best served warm. The meat pie – you read that right. But fear not, this is no dirty street pie. With a perfect pastry crust this mini pie with bush tomato relish just took this high tea up a notch. 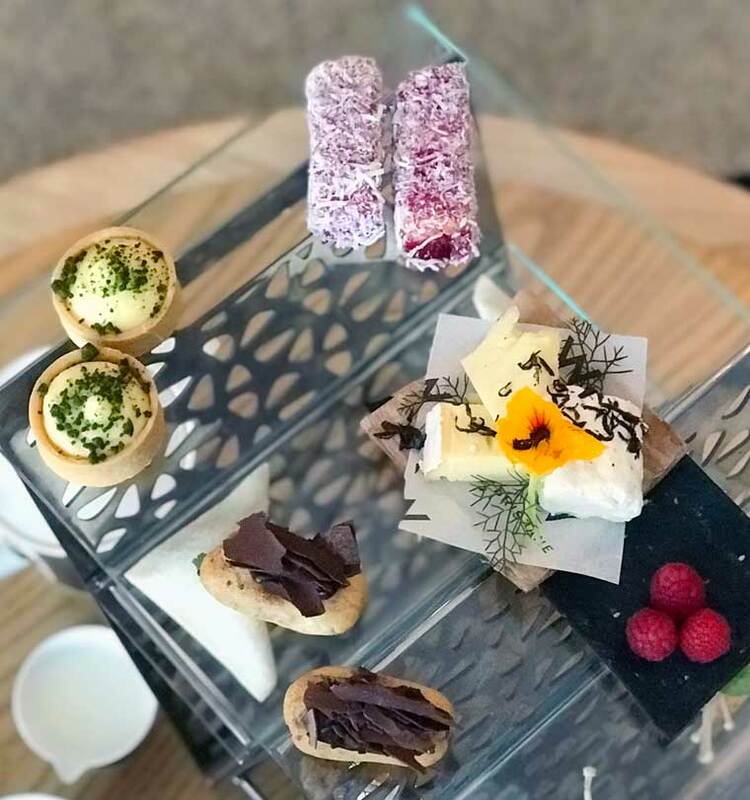 The scones are also served during this portion of the high tea, but if you thought these would be traditional, think again. These miniature lemonade scones, which almost seem more like a soft bite-size biscuit were paired with proper clotted cream, so thick it goes on like butter and could make your heart stop, and quandong jam. I loved the jam, my guest was not the biggest fan, but I found the sweet and slightly sour flavour a real treat. The scones were not the standout of this high tea, but how could they be really, with so much competition on the plate? Next, we had the sweets of hibiscus jam lamington, Cooktown orchard macaron, native bush lemon tart, mini Milo éclair (amazing, I know) and torched iron bark honey nougat. These were truly unique and special. While I was not the biggest fan of the strong flavours in the orchard macaron and found the aftertaste too strong and bitter, I respect what the chef was trying to do here and can appreciate that this just may have not been to my taste. My standout for this portion was the Milo éclair. You just can’t go passed the nostalgia – who would have thought you could make Milo fancy? And just when you thought it’s all over, you finish it all off with some cheese. I told you this wasn’t going to be traditional. 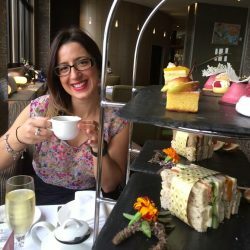 If you’re a die-hard high tea aficionado, you’re probably screaming at the very thought of this, but it was truly the perfect way to end a unique experience. The selection of cheeses included L’Artisan Mountain Main from Geelong, vintage cheddar from Maleny and camel milk Persian feta from Summerland Camel Farm. I am happy to report the camel cheese was a delight and surprisingly mild and creamy. I truly loved how this high tea challenged the perception of what a high tea can be but also forced the diner out of their comfort zones. Even if you don’t absolutely love it all you will love experiencing something unique and inspired. This high was also served with a selection of Blooming Teas on Silk Black Fine Bone China. I almost forgot to mention the best part, you’re invited to ask for seconds from the sandwich portion, if you can fit anymore in! We managed to squeeze in an extra serve of the charcoal cone filled with Fraser Island crab, because why would you not?